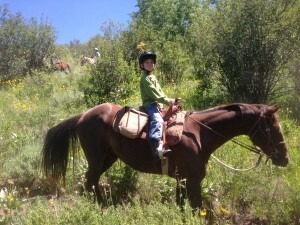 There are Riding Camps at our Linn Canyon Ranch for all ages and ability levels. So come spend the day at our beautiful ranch with horses and our talented horse staff while you laugh and learn! 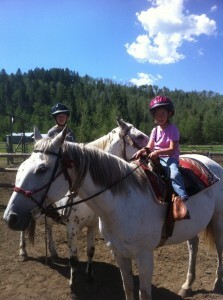 We offer programs to suit every level of horse enthusiast out there. 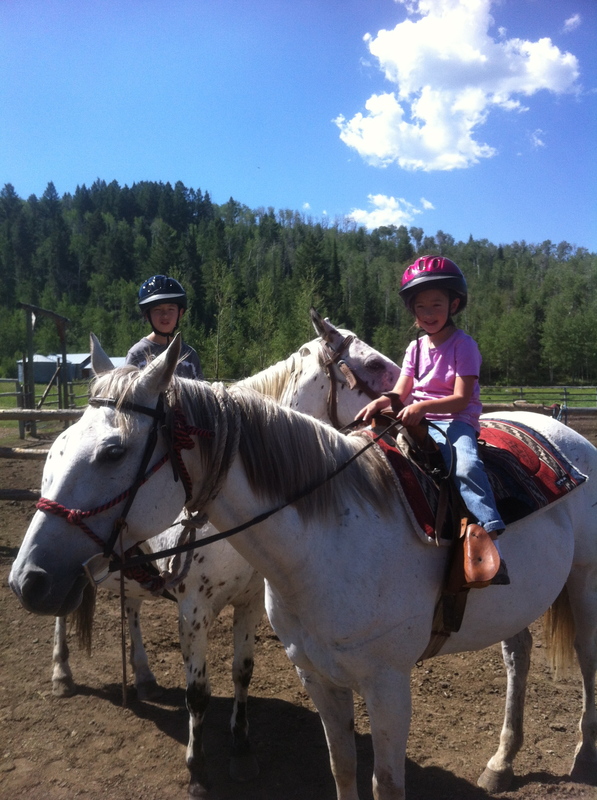 From developing basic riding competence or learning how to care for your first horse, to more advanced skills like barrel racing and pole bending, or even an introduction of how to horsepack/camp in the mountains…. we’ve got it all here and can’t wait to teach you! Let our friendly guides take you on a ride like no other to experience the best that horses and people can share! Here is your child’s chance to be a real cowhand! The curriculum is flexible depending on the group’s abilities and interests, but following is a sample curriculum. Day 1 will introduce your child to the barn rules, our staff and herd, and horse basics (catching and moving safely around horses as well as essential knots they will need to know). We will culminate with a horse ride in the round pen/arena while we play fun games, practice our balance, and learn basic riding skills. Day 3 will take us out onto the ranch’s winding, rolling, wooded mountain trails (provided skills are there) for a ride with a picnic lunch. Everyone will help with the chores from feeding and watering the ranch horses, bathing/grooming, mucking, and tack organization. Offered: Package includes 15 hours on instruction. Cost: $480 (Includes instructor gratuity. 6% sales tax will be added) for the first child, $430 for additional children in a family. To reserve each child’s spot, we request a $100 deposit. Please email melanie@linncanyonranch.com for more information or to inquire about availability. Campers should bring their own lunch, snacks, sunscreen, water bottle, and insect repellent if desired, and epi-pen if they are allergic to stings. Close-toed shoes are required, with a relatively smooth sole preferred. Cowboy or riding boots are, of course, optimal, but not required. Long-sleeved shirts are best students should also bring some warm and water-proof layers. We never know what the whether has in store for us! Offered as a 5 hour workshop, this program is customized for the family or individual that is looking to experience private time on the ranch. You pick the focus; whether your goals are learning about horses for the first time or honing your riding skills in the mountains, our well-rounded, experienced staff at Linn Canyon Ranch will design a fun-filled day that specifically caters to your aims. Activities such as riding in a confined area and/or up in the mountains, groundwork training of a horse, the basics of barrel racing, or extended practice trotting and cantering safely, you can do it! We also offer this workshop for those looking to get more horse packing skills/knowledge so they can feel confident taking their own string into the mountains. Call us to construct your personalized workshop today! Lunch is included with this program. Experienced, knowledgeable instructors will guide each child alongside gentle, friendly horses as they learn how to lead, ride, steer and stop their horse. They will learn the basics of trail riding and corral riding, in addition to basic equine behavior emphasizing safe habits while working with their horse. Other skills include proper grooming, saddling and care of tack. 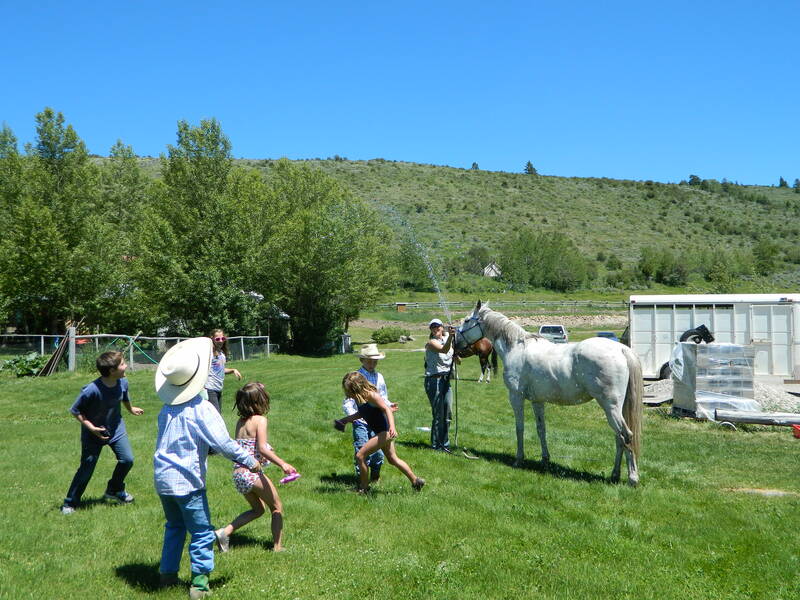 Time will be had for bathing a few horses and running in the sprinklers (weather permitting) for group bonding of the “club members”! On the final day parents are invited to watch a presentation of their child’s riding skills in the arena. This longer day camp will focus on refining the basics of riding at the walk & trot and intro to canter in the corral, as well as developing their skills to trail ride with more control and confidence. We will delve deeper into horsemanship by learning more about horse care and the various horse careers one could have someday! 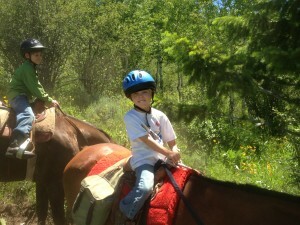 A long trail ride on Wednesday with lunches packed for the hills will reward the student’s new skills. On the final day parents are invited to watch a presentation of their child’s riding skills in the arena. CALL TODAY AS SPACES ARE LIMITED!! Yeehaw!! Once it is confirmed that space is available for your child and you have made a deposit to hold your spot, you will receive a welcome packet with online form links and rider information to get your child ready.